You've spent your hard earned money on the Ford Powerstroke Diesel option in one of the most popular and best engineered trucks there is, now don't you think you owe it to yourself to use the very best oil in it? And don't let your local dealership service center tell you that you you have to use their brand of oil to "maintain your warranty". That is a false statement by the dealership. We often receive calls from customers that were told this by their servicing dealership. This practice is not authorized or condoned by the auto manufacturers, but the fact is it still goes on. it is also illegal unless they provide it free of charge. There are Federal laws that protect you against this. Please read our Warranty Laws You Need to Know section of this website to learn more. Specifically for the Ford Powerstroke Diesel AMSOIL engineers and manufactures a 15W-40 Synthetic Heavy Duty Diesel Oil (as well as Series 3000 5W-30 Heavy Duty Diesel Synthetic) that when used in conjunction with the AMSOIL Eao99 engine oil filter (7.3L). Eao88 (6.0L) will allow you to travel 25,000 miles/1-year between filter changes and 25,000 miles/1-year between oil changes for normal duty service If you use oil analysis you can usually go longer than 25,000 miles. We are PowerStroke Diesel engine, powertrain and chassis experts and are here to help you achieve optimum performance and longevity from your Ford Power Stroke Diesel. changed at original equipment manufacturer (OEM) recommendations. frame and hose routing, just email me. technology and increases torque by 39.62 ft. lbs and horsepower by 24.91 Hp. is 100,000 miles under normal service or 50,000 miles for severe service. The front and rear differentials use the AMSOIL Severe Gear 75W-140 Gear Lube. bottle of Slip-Lock treats differential capacities of two to four quarts. Other AMSOIL benefits include reduced sludge and deposit formation, extreme temperature protection, improved fuel efficiency and rust and corrosion prevention and it does not void any new vehicle warranty. AMSOIL Synthetic Lubricants meet and exceed all API rated and Ford specifications. a severe high temperature deposit test. The one at the far right is AMSOIL Synthetic 15W-40 Diesel oil and the others are major brand petroleum diesel oils. (left to right: Chevron Delo 400, Cummins Premium Blue, Shell Rotella T, AMSOIL (15W-40). The test clearly shows that AMSOIL keeps engines cleaner longer than other major brand diesel oils do. Which oil would you rather have protecting your engine? We are here to help you learn the facts and show you how you can use AMSOIL motor oil and get a superior product and also increase the performance and add to the longevity of your Ford Power Stroke Diesel plus save time and money. The Power Stroke Diesel is an excellent vehicle and exceptionally well engineered by Ford Motor Company and International. are ways to make the performance and longevity even better with AMSOIL Synthetic Lubricants. Powerstroke Diesel which can clearly benefit from the use of synthetic motor oil is the turbocharger. When a turbocharged engine is shut off immediately after a high speed run, "heat soak" occurs from the engine, and it considerably increases the temperature in the turbocharger. Over a period of time this can lead to deposits that can block the oil flow to the turbocharger bearings, leading to turbocharger seizure. Synthetic engine oils that are inherently more thermally stable than petroleum engine oils have been shown to keep turbochargers considerably cleaner than petroleum engine oils. A poor petroleum oil will give turbocharger seizure, caused by blocked oilways, in under 100 hours of a severe "heat soak" test cycle. A good petroleum oil will survive for 100 hours but with considerable deposits and incipient blocking. A good synthetic oil will maintain the turbocharger in almost "as fitted" condition. Read on to learn the many more ways in which your Powerstroke Diesel/ Ford Diesel can benefit from synthetic oil. 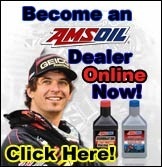 Simply changing your oil more often with petroleum oil will not give you all the benefits that AMSOIL offers. You will not get improved fuel economy, you will not get reduced engine wear, you will not get reduced operating temperatures, you will not get extended drain intervals and you will not save money in the long run. Please, allow us to show you a better way. We are here to help you. You have everything to gain and absolutely nothing to lose. AMSOIL has been in business since 1972 and was the first company in the world to develop an API (Automotive Petroleum Institute) rated synthetic lubricant for automotive applications. They coined the phrase "extended drain intervals" 35 years ago and have been on the leading edge of technology and innovation ever since then. We have many satisfied customers using AMSOIL products in both their commercial, trucking, fleet as well as personal, family and recreational vehicles. We hope you will allow us to show you a proven better way. We are here to help you and are at your service to assist you in your advanced technology lubrication and filtration needs. For 2007 and newer Power Stroke's with the 6.4L engine and Diesel Particulate Filters AMSOIL offers a 5W-40 Premium Protection Oil that is engineered to be changed as per manufactuer's recommendations, or longer with oil analysis testing. The other option is to install an AMSOIL Dual Remote By-Pass Filtration System . With this system you only change your oil when oil analysis indicates. The AMSOIL Ea full flow filter is changed at 25,000 mile intervals and the by-pass filter is changed at approximately 25,000 miles for normal duty service. The AMSOIL 15W-40 Synthetic Heavy Duty Oil or the Series 3000 5W-30 HDD does not break down like conventional petroleum based motor oils, is much more shear stable and does not have the waxes, paraffins and by-products that come out of crude oil that is pumped from the earth. The by-pass filter removes the particles that cause wear in your engine down to less than one micron (a micron equals 0.001 mm) and keeps the engine oil analytically clean so you do not need to change your oil for a long time, while still getting far better protection than someone that changes their oil every 3000 miles. We are experienced at installing these units on Powerstroke Diesels (and all vehicles) and can provide you with exact installation instructions, tips, bracket prints and photographs. For example, one of the Powerstroke Diesels in our Dealer Group had over 87,000 miles on the same AMSOIL 15W-40 Synthetic Diesel Oil prior to changing to the AMSOIL Series 3000 5W-30 Heavy Duty Diesel Oil . Laboratory oil chemical analysis every 15-20,000 miles indicates the oil is perfectly suitable for continued service. Other customers have traveled well over 100,000 miles and oil analysis still indicates no oil change necessary. In addition, the AMSOIL By-Pass filter will also remove up to a pint of water from your vehicle's lubrication system, which is especially important in a diesel engine. 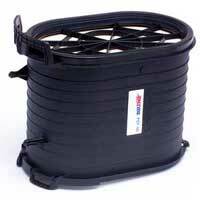 Without this the water promotes rust, corrosion and rapid wear. Internal engine heat also creates acids which also wear the engine components. The water and acids build and continue to work destroying your engine even after engine shutdown. Oil analysis provides a big return for your small investment by extending equipment life by preventing premature component failure, reducing maintenance costs by eliminating unnecessary component changes and a decrease in downtime due to premature scheduled maintenance as well enabling calculation of optimum drain intervals that will reduce lubricant costs and assure maximum equipment protection. 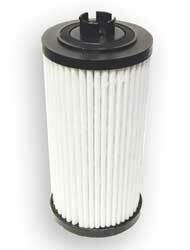 Your regular full flow engine oil filter will only remove wear particles down to the 20-25 micron range. The filter cannot remove finer particles because the oil must be filtered quickly while removing most of the particles present in the oil, except the particles below the 20 micron range. A study completed by Federal Mogul Corp. analyzing over 7000 main and connecting rod bearings concluded that 60% of all engine wear occurs in the 5-20 micron range. This is why no matter how much you change your current full flow oil and filter, regardless of brand, that you still are not removing the particles that cause the greatest wear in your engine . If you choose not to install the Dual Remote or Single By-Pass filtration system then the AMSOIL Ea Oil Filter would be of a significant benefit to the long term durability of your engine as well as allowing for 25,000 miles of service on the filter and 25,000 miles/1-year on the oil. Ea Oil Filters feature advanced full synthetic nanofiber technology, making them the highest efficiency filters that are available for the auto/light truck market. They have an absolute efficiency rating of 98.7% at 15 microns and 50% at 7 microns. 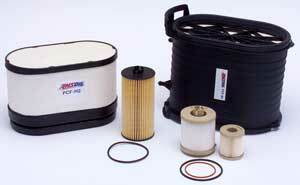 6.0 L Powerstroke Powercore Air Filters, Fuel Filters and Super Duty Oil Filters. AMSOIL Introduces World’s First Oil Filter Cartridge for Diesel Applications with Nanofiber Technology. AMSOIL INC. of Superior, WI has introduced a new premium, high efficiency cartridge oil filter utilizing nanofiber technology for Ford 6.0L diesel engines ranging from 2003 to 2006. The new EaO-88 is the world’s first oil filter cartridge for diesel applications using advanced submicron full synthetic media. The EaO-88 provides an efficiency of 98.7% at 16 microns, significantly higher than the OEM filter. in conjunction with AMSOIL synthetic motor oil. Because of its improved oil flow, an additional benefit of this synthetic filter media is that oil is delivered to key engine components quicker, thus enhancing the lubrication process during cold weather starts. Fast Fact: A nanofiber is less than one micron in diameter. A human hair is 80 microns . Truck sales represent the fastest growing segment of the U.S. automotive market. Over 50 percent of new vehicles sold today are trucks, and now, AMSOIL has expanded that market even further with the addition of premium filters for Ford 6.0L Diesel PowerStroke™ engine. in innovative, layered, fluted filter media which allows air to enter an open flute while forcing it out an adjacent flute, allowing only clean air into the engine. Dirty air is effectively filtered and cleaned in only one pass through the media. 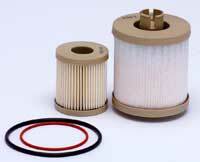 Lighter, smaller design simplifies filter servicing. The AMSOIL FFK-60 Fuel Filter incorporates both a primary and secondary filter for maximum fuel cleanliness. The primary 10 micron filter, located in the Horizontal Fuel Conditioning Module (HFCM), performs initial fuel cleansing before sending the clean pressurized fuel to secondary four micron filter, mounted to the oil filter housing. the tank or returned to the primary filter.